NYC, 02/02/2019, 1:00PM. Marshall (2017): Story of the first African-American Supreme Court Justice. 118 min. Director: Reginald Hudlin. 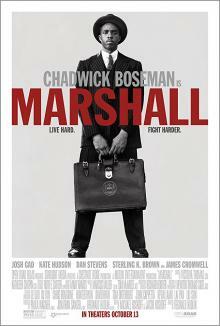 At the 90th Academy Awards, Marshall received a nomination for Best Original Song for "Stand Up for Something". It received positive reviews from critics but grossed just $10 million against a $12 million budget.